Volkswagen cars are ready to take a bold leap into the future with the first models on the Apple CarPlay roster about to hit showrooms. The German company's new MIB II infotainment system will be available on most 2016 models and as well as being compatible with CarPlay, Android Auto and MirrorLink it will offer a wealth of ways to control your car. 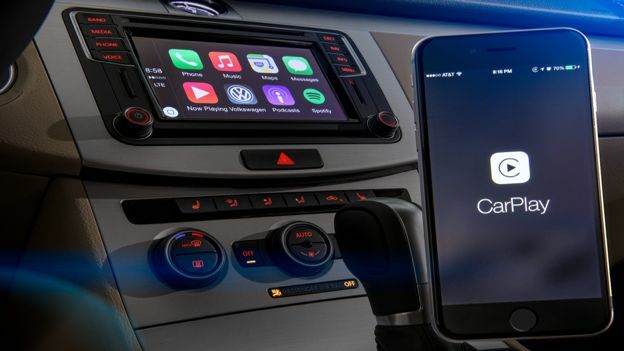 That's because 2016 Volkswagens will also come equipped with the company's own Car-Net suite of apps that includes a number of innovative features such as remote lock control, remote honk and flash, stolen vehicle location, automatic crash notifications, vehicle monitoring and a lot more. Car-Net, although free for six months, comes in at a whopping $199 per year with various discounts available for two year ($378) and three year ($540) contracts. MIB II, CarPlay and Android Auto, in comparison, are completely free. Read our CarPlay and Android Auto comparison here. There are four different MIB-II offerings with CarPlay offered by Volkswagen and the one that you get depends on the model and trim type chosen. At the bottom end there is the Composition Color 5-inch resistive 400 x 240 resolution touch screen that doesn't actually include CarPlay support. After that, the 6.3-inch and 6.5-inch Composition Media screens support CarPlay and App-Net but only on certain trims. The range is topped off by the Discover Media unit that stretches to an 8-inch screen in the e-Golf SEL Premium. The Golf R and Tiguan featuring CarPlay have already landed in dealerships and models will continue to filter through to showrooms as the year goes on.